A new plug-in bundle from Dutch developers Audio Ease brings together three unique sound-shaping tools. There are some plug-ins you just have to have: a neutral and a 'characterful' EQ, a flexible reverb, a handful of compressors, maybe a good delay. After that things get a bit more specialised in the murky world of filters, tone processors and multi-band tools. Go further and you're at the outer reaches, with granular synthesizers and step sequencer-driven curiosities — and it's here that Audio Ease's Rocket Science bundle belongs. This is a collection of three apparently dissimilar plug-ins which can do some interesting things to your tracks that would be difficult to achieve in other ways. Just how useful they are might depend very much on the type of music you make and how willing you are to embrace the unfamiliar in your pursuit of new sonic horizons, but they're certainly an intriguing bunch. Rocket Science is available in HTDM, RTAS, VST, MAS and AU formats for OS X, and in MAS format for OS 9. Installation on my own system was a brief and painless affair, and a decent PDF manual is included — not that you'll need to refer to it very much. Authorising the plug-ins is done via an on-line challenge/response system, so you can do it immediately, and Audio Ease provide you with a couple of authorisations in case you need to run Rocket Science on your laptop as well as your desktop Mac, for example. Roger is a 'Multiple Gender Vowel Bank'. It's not Roger himself who's of multiple gender: the term is explained by the presence of his companions Cindy and Patty. Together they provide filtering effects that make it sound as if your audio is to some extent being 'pronounced' by voices of three different pitches. Taken on their own, the individual vowel sounds on offer just add what sounds like a very specific EQ curve, perhaps with some 'formant' resonance, to whatever audio is passing through the plug-in — a strong effect but not terribly exciting. Roger comes to life, though, through making transitions from one vowel to another, as it's then that the effect becomes really audible. You can choose vowels manually, and if your host sequencer supports it, record the changes as automation data, while Audio Ease also provide Roger with a step sequencer that switches between vowels automatically. As you'd expect, this can be flexibly sync'ed to the host sequencer's tempo, and the resulting rhythmic effects can be enhanced by tweaking the Beat Skips parameter. This causes Roger to not always change vowel on every beat, instead introducing some syncopation and cross-rhythms into the proceedings. The Portamento parameter determines the speed at which one vowel 'morphs' into another. The quality of the vowel sounds themselves is controlled by the Bandwidth parameter. At its maximum value no filtering takes place at all, and when set to its minimum, Roger breaks down into high-resonance ringing nonsense that almost completely obliterates the input signal. Between these two extremes there's plenty of usability. You have to hear the sound to really appreciate it, but it's like a combination of a swept band-pass filter, a phaser and a vocoder, and there's something undeniably charming about it that makes it into somewhat more than purely a novelty effect, though at times it can be downright funny. It works extremely well on pad and sustained sounds but can sound great on whole mixes, on drums, and on vocals, too. Having said that, though, the full vowel effect is only achieved at the expense of most of the high-frequency content of the input signal — it's certainly a plug-in that draws attention to itself. 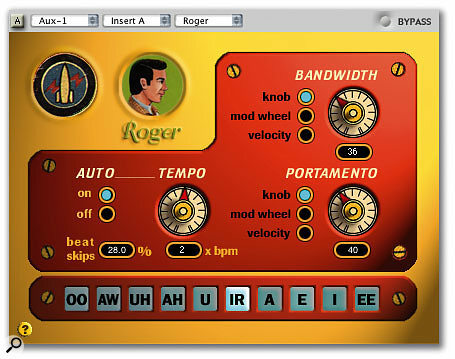 The final trick up Roger 's sleeve is MIDI control. As long as your sequencer can send MIDI to plug-ins, you can choose between all 30 vowel types (10 for each character) by playing MIDI notes between C2 and B4, with the Bandwidth and Portamento values being set by key velocity or cc1 (mod wheel). This type of vowel selection, in particular, can make for some rhythmic effects which sound absolutely superb. Having vowel-filtered your sound, what better than to hand it over to a psychoacoustic flight-path simulator? Orbit is a processor that combines reverb-like early-reflection generation with filtering and Doppler effects to 'localise' the sound it's treating in a virtual room of anything from 8 x 8m to 80 x 80mm — it is, in effect, a sort of 26th-century panner. Your own position in the virtual room is set by dragging an icon showing two speakers either side of what appears to be the planet Saturn (why not? ), whilst the audio you're treating is shown as a red ball. This always represents a mono sound source, so if you place Orbit on a stereo track the two channels are summed to mono in order for the location of the red ball to be meaningful. Having set the distance your speakers (or indeed headphone drivers) are apart — which can make quite a difference to the final sound — you can then start experimenting with different room sizes and sound-source placements. Orbit can calculate up to 60 early reflections, which represents the dry signal bouncing off the four virtual walls up to a maximum of five times. To save processor power you can choose to make Orbit calculate fewer reflections, or even none at all, but even with comparatively few reflections the sense of location can be uncanny, responding as it does to your settings. The High Damp parameter makes the walls more or less absorbent, so you can choose a bathroom or airing-cupboard ambience, or anything in between. 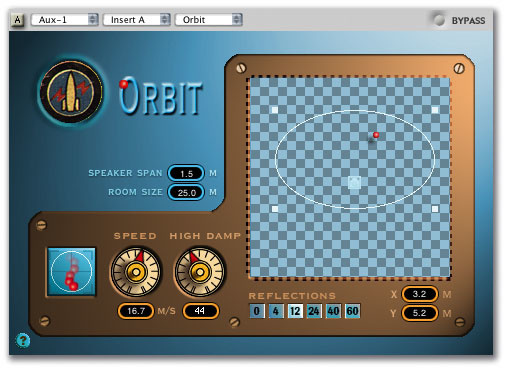 It is possible to just set your speakers and your sound source's positions and leave it at that, but Orbit goes further, and lives up to its name, by offering some movement paths for the sound source via a colourful pop-up menu. The sound source can move smoothly from one position to another, as determined by your mouse clicks and the Speed parameter, or continuously around the perimeter of an adjustable oval (in either direction). It can also, as the Rocket Science manual wryly observes, 'move randomly about like a drunk' within the oval. Where this all gets interesting is when you put the 'listening position' inside the oval path of the sound source, so the sound source seems to encircle you — that's where the psychoacoustic filtering comes in. It's also possible to place the listening position right on the sound source's path, which can make it sound like the sound is passing right through your head. Additionally, with the right room size and movement speed, Orbit will do a fire-engine-like Doppler effect. Orbit is a very interesting alternative to a conventional panner for mono tracks: even when set to produce no early reflections, it does seem to introduce a 2D element in a way that a conventional panner can never achieve. Linked with a really good reverb, perhaps Audio Ease's own Altiverb, I could see this as being a viable tool for speech recording post-production, for example. It works nicely for instruments, too, creating a tangible sense of separation. The 'moving' modes are impressive but could clearly get tiresome if used for too long. 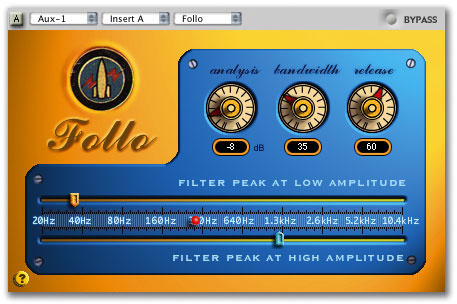 Follo, an 'Energy Driven Band Booster', is another filter effect, but it's very different to Roger. It's a resonant band-pass filter whose cutoff frequency is determined by the input level to the plug-in and limited to a frequency range set by a couple of sliders. The sensitivity of the cutoff frequency to input level is set with the Analysis parameter, the overall strength of the effect with the Bandwidth knob, and what can only be described as the 'squelchiness factor' by the Release time. If this doesn't seem terribly complex that's because it's not — Follo is brought to life by the audio it treats, and then it's simply a case of tweaking the relatively few parameters to tease out the effect you want. Audio Ease give two prime examples of Follo 's possible applications — as a guitar auto-wah, and as a 'bass generator', presumably for bass drum tracks. There's no doubting this plug-in comes from the planet 'wah' but I did find it could work on a surprisingly wide range of input material, from strings to synths, and it can do some deliciously evil things to individual drums, even to a wide-band drums submix. It's also good combined with other effects — Audio Ease's suggestion of putting it after a delay works very well, especially as the gradual decay causes Follo to respond in a slightly different way for each repeat of the signal. I also tried putting Follo after a reverb which was set up in 'aux' rather than 'insert' fashion — the effect was very nice, and very novel. There's a lot to like about Rocket Science. To some extent the individual plug-ins are one-trick ponies, in the way that some off-the-wall freeware efforts often are. But that's where any comparison with freeware or shareware ends: Roger, Orbit and Follo absolutely ooze quality, as much from their user interfaces as from the often ravishing sounds they conjure up. Just as with Riverrun, a plug-in from Audio Ease's Nautilus bundle which is without doubt one of my 'desert island' effects, Rocket Science might not be what you reach for on every project, day-in, day-out, but it has an uncanny ability to inspire and refresh, and also to create some extremely novel and distinctive sounds. Also, the effects are not so limited in scope that you'd hardly ever use them. I could imagine whipping out Follo and Orbit fairly often, and Roger as often as I could! It helps, too, that the plug-ins run very efficiently, even on my low-end dual G4, so you can experiment with them without feeling they need to be handled with kid gloves. Gripes? I don't have any, but it should be pointed out that AU versions of the Rocket Science plug-ins don't support automation via manipulation of their graphic interface controls. This could be a problem for some Logic users, but it's possible to control virtually every parameter and setting with MIDI messages, and the manual contains exhaustive information on this. Perhaps a harder question to answer is whether Rocket Science is worth the £160 asking price. For plug-ins that aren't of the bread-and-butter variety that's quite a lot, and certainly lifts the bundle out of the 'whimware' category. But you are getting the broad plug-in format compatibility as well as quality, and additionally, Audio Ease's customer support is up there with the very best. The bottom line is that Rocket Science won't appeal to everyone, and doesn't try to, but for those creative types who are always on the lookout for something unusual and distinctive it could fit the bill perfectly. It's always a pleasure to work with software of this quality, and Rocket Science is certainly an extremely welcome addition to my own plug-ins folder. Offers a range of interesting and contemporary-sounding effects that would be difficult to achieve by other means. Available in a wide range of plug-in formats. Easy to use, with great user interfaces. Good manual and tech support. For the money, it might be a touch too quirky and specialised. No parameter automation in Logic except via MIDI. A classy suite of unique-sounding effects. What's not to like?